Three Rivers Corporation received 2017 Excellence in Construction Awards and a Diamond Safety Training & Evaluation Process (STEP) Award from Associated Builders and Contractors’ (ABC) Greater Michigan Chapter at the Greatness & Gratitude Awards Celebration on Thursday, September 7th. ABC of Greater Michigan’s Excellence in Construction Awards recognize entire construction teams – construction owners, designers, and contractors – who work collaboratively to complete projects safely on-time, with exceptional quality, and in a cost-effective manner. Submitted entries are judged on a project narrative, detailed description of the construction process, time, budget, and space restrictions, and any special challenges associated with the project’s completion. ABC of Greater Michigan honored Three Rivers Corporation for their design and construction of MidMichigan Medical Center – Mt. Pleasant – GC/CM: New Construction over $10 Million, and Helping Hands Dental Center – GC/CM: Addition/Renovation under $1 Million. Each award speaks to the quality craftsmanship and exemplary project management that is Three Rivers’ legacy. The Safety Training and Evaluation Process (STEP) Award recognizes the efforts of ABC members who strive to achieve effective safety practices within their companies; it is an organized approach for analyzing and developing safety and loss prevention programs. Additionally, Three Rivers provides contractors with a tool to objectively evaluate their safety programs, policies, procedures and training. “We are proud of the hard work by the men and women of Three Rivers and how their efforts bring customers vision to reality. 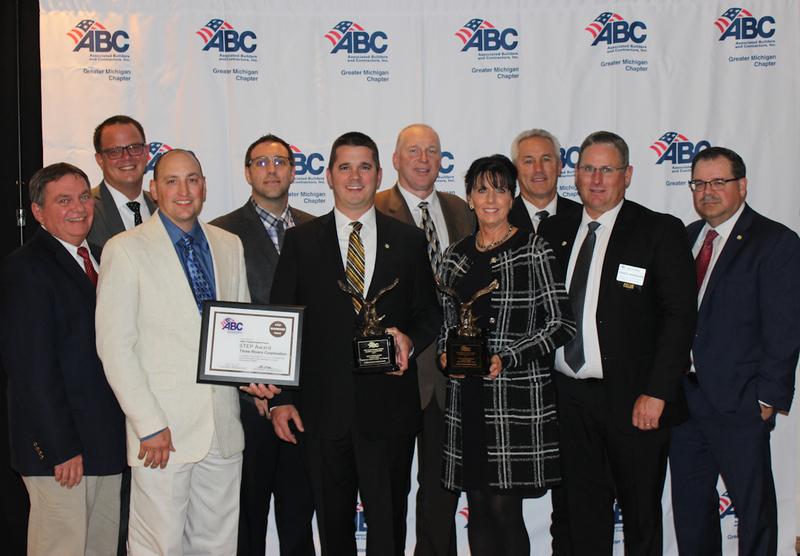 This recognition by ABC Greater Michigan demonstrates our commitment to excellence and why Three Rivers is the contractor of choice for so many. Simply put, we are more than construction,” said Jon Lynch President at Three Rivers Corporation.